When it comes to digital instruments some are easier programmed than others. Take for example a drum kit, that’s why it was one of the instruments to go digital. But when you talk of guitars and choirs, many would argue that they are best left alone. And many people listened to those warnings. But not Vir2. You see, there are 2 different kinds of people (and business) in this world. The first are those who are satisfied with the status quo, no matter how limiting it may be. The second kind of people are disruptive – they don’t give a hoot about status quo. They like breaking barriers. Vir2 falls in the second category. They thrive on disrupting the music industry. Funny thing about these 2 groups is that the complacent always wish they could do what the disruptive do – but they don’t have the guts to do so. What about you? Do you have guts? Guts for an electric guitar that pushes the envelope by going fully digital? If so, meet Vir2 Electri6ty. When it comes to music sampling, the recording is the easy part, it’s the playback engine that causes many programmers and music producers nightmares. If the engine fails to playback requested notes and sounds to the specification of the user, the whole platform becomes a failure. And this is exactly where Vir2 Instruments hit the nail right on the head. They managed to combine great recordings and brilliant programming to come up with digital guitar sounds unparalleled by no other – especially with the Vir2 Electri6ty virtual guitar. The Vir2 Electri6ity offers very detailed recreations of 8 classic electric guitars that require a whopping 28GB of memory space. That alone goes to show how much detail went into the Vir2 Electri6ty to make it sound like a real electric guitar as much as possible. To be more specific, more than 24,000/24-bit samples were taken of each guitar — note that it’s not all guitars, but each guitar! This means every possible tonal and stylistic combination of play is fully covered. Frankly speaking, that is an insane pursuit of perfection. No wonder Vir2 Instruments are disruptive – they push limits. An important point to note about Electri6ity is it’s use of Kontakt 4’s Velocity Morphing (VMT) and Articulation Morphing (AMT) technologies which allow seamless morphing between dead mute, half mute, and sustain articulations. It is this morphing technology that gives it its realistic sound. And when we all thought Vir2 Instruments couldn’t push the envelope any further, they did. It’s one thing to program an electric guitar, but an acoustic guitar is a whole different, well, guitar. Unlike an electric guitar that produces sound by way of electric signals and pulses, an acoustic guitar produces sound using every component of the guitar’s body (that’s the simple explanation, it goes deeper than that). Because of that, recreating an acoustic guitars sound is very difficult. But Vir2 Instruments don’t care, they just had to do it. With the Vir2 Acou6tics, the 6-string and 12-string steel, nylon strung, ukulele, mandolin and guitalele all have between 4000 and 8000 samples per instrument, a very impressive range of articulations (finger-picked and plectrum options where appropriate), and stereo miking. The Vir2 Acou6tics’ playback engine amazingly analyses the keys you press (in real time) and interprets them based on your current patch settings. The result is a very realistic guitar sound, unlike many “canned” guitar sounds on the market. 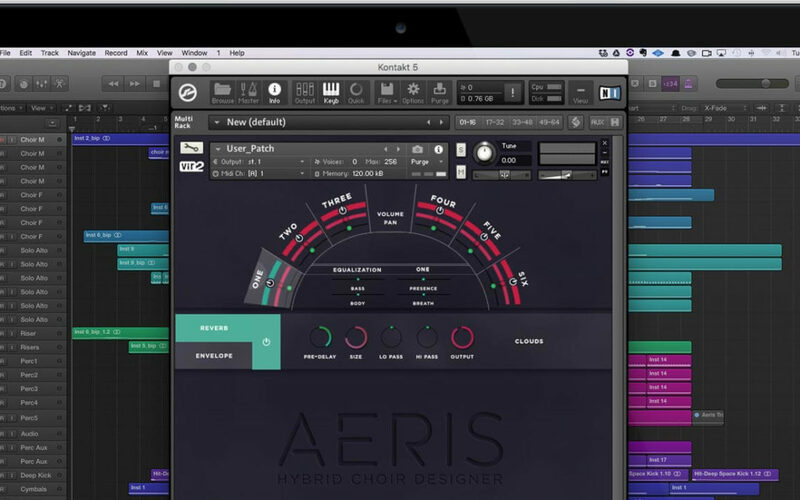 Vir2 Aeris is an effects plugin whose main function is to build you the choir of your dreams. 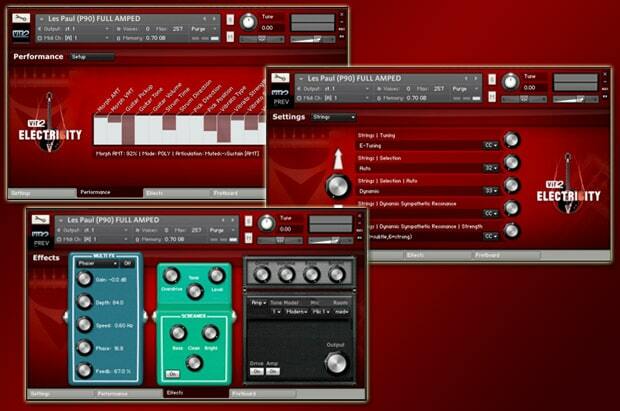 Aeris, like all Vir2 Instruments, is a Kontakt library from Native Instruments. To those in the know, that’s a power-packed statement right there. Unlike other effects though, this one is quite light on resources needing on 9GB of space. Despite only having 3 patches (Performance Patch, User Patch, and Pads Patch), this nifty software packs a big punch. You can start using the Performance and Pads patches straight out of the box, but the User patch requires you to upload your own samples prior to using it. The Performance Patch has 6 vocal groups (Bass, Tenor, Choir M(ale), Choir F(emale), Alto, and Soprano) all laid out in a conductor/orchestra configuration on the screen (definitely makes it easier to conduct your virtual choir). Vir2 Aeris also equips you with 4 different vowel types – (A, O, U, M); giving you absolute flexibility for performing realistic choir parts, even to the extent of overlapping some of the different groups. With the Aeris Vir2, you have a full choir at your beck and call to perform exactly as you would want them to perform – right there in your bedroom. Go ahead, add this amazing piece of software to your repertoire of tools – you’ll be glad you did.